We have lost our dog, Forrest. We are searching for him like crazy and doing everything we can think of. We lost him in a rural area so he may be facing some wildlife dangers. Hopefully he headed toward people. You just never know with Berners. They are shy around strangers. As a result there isn't much else going on around the household. Sleep is the toughest commodity to come by right now so I have been doing some cross stitch to keep my mind from going crazy. I am so indecisive sometimes. I have been trying to decide for a month whether to add the fish appliques to a quilt top and how to do it. It's a king-sized quilt and my biggest problem is not having a design wall large enough to accommodate the layout so I could ponder it fully. Then I had the idea to lay it on my bed and look at it. It was so helpful! I kept making the fish swim into each other but seeing it on the bed I realized the quilt already had a "direction" to it so it made sense to make all the fish swim upstream. Now I can move onto fusing my appliques in place and top-stitching. It's so hard to decide! And I've been waiting for the Connecting Threads website to have a sale on thread. I need a stash for some top-stitching and for binding. Sew fun! I hadn't heard of Carrie Underwood's song, "Jesus Take The Wheel," until this trip. (I get all my music from Jazzercise routines.) 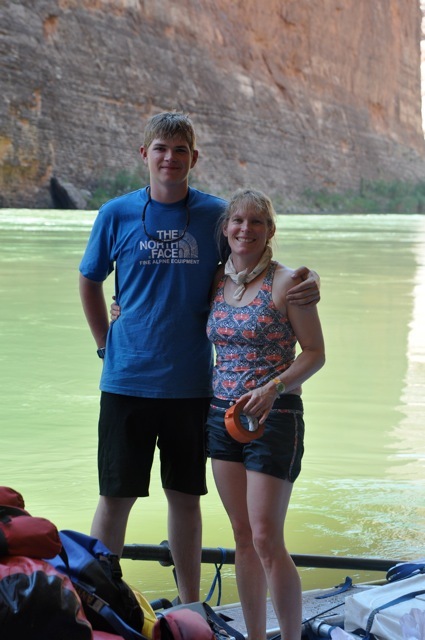 Riding rapids on the Colorado River can intensify your relationship with God. I wasn't the only one in our party who felt that way. T.S. 's family boat was right behind ours on the Crystal rapid ride. His dad, our fearless leader, started this whole expedition by winning a permit to raft a private trip on the Colorado River. His sister is Ballerina Girl. His mom, trip photographer...she earns her call sign a few days later. First, we have to get through Crystal. This is when T.S. asks for a little divine help as his family enters Crystal Rapid. I found out after they made it to the bottom, still riding in their boat, that this phrase, "Jesus take the wheel," concluded the family prayer as they entered the rapid. T.S. felt moved by the moment. We made it through our most challenging rapids so far. Day 4 ended with all our boats intact. It was the 4th of July and we had a lovely celebration at camp that night. Our trip leader read a portion of the "Declaration of Independence." A few adult beverages were drunk. A little light show for the kids of all ages. It was a good ending to a challenging day. My rotation started again for kitchen duty that night with clean up. We had a big meal, grilled chicken breasts and steak with baked potatoes plus a green salad. For dessert, a poppy seed cake baked in a dutch oven in the coals from our steak dinner. It took a long time to make this meal so it was a late night. One good thing about camp chores is my mind was kept busy because tomorrow we would tackle our first "nine" rapid - Crystal. But first up on Day 5 was a stop in civilization. 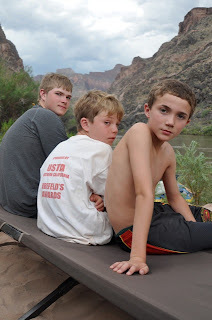 Just a mile down the river from our camp was Phantom Ranch, a national park facility. It's the only lodge below the Grand Canyon Rim. It's a drive-to point that folks can access for hikes into the canyon. It could have been a way out for me but I didn't know that until we were there. By now I was skeptical about all hikes...even one to Phantom Ranch. Some of the hikes we had taken were lovely but sometimes they were challenging. Supposedly there was a place to fill up our five, camp water jugs (each holding five gallons), but again, we would have to hike them up to get to the water. HA. No one wanted to do that. 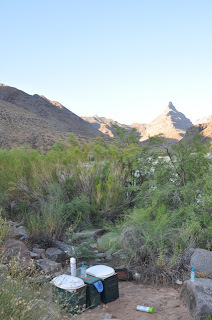 We would just pull out the water filter and pump water from the river at camp later that night. It was a nice surprise to see a real trail and other humans. I enjoyed my brief time with modern amenities. We got the best lemonade with ice! We used restrooms with running water and flushing toilets! Then it was time to get back to reality. Time to hit the river. We had three, "eight" rapids to hit before Crystal. Those rapids all proved to be pretty challenging. It's a funny thing. The river seemed to be set up to give us on-the-job training. It was a confidence builder. Something else contributing in mostly a good way, was the high water level of the river. To my inexperienced eye, the higher water level gave us more options when it came to figuring out routes through the rapids. On the down side...it made the big rapids...even bigger. We pulled over to scout Crystal. There was quite a crowd scouting it with us. We watched a couple of huge commercial boats just skirt the huge holes. Their customers got very wet. We were hoping to avoid getting as close as they did to the big holes since our little boats might not fare so well. This is a photo I found on the internet of one of the boats we were renting being rowed through Crystal on another party's trip. It's a little easier to get a perspective of the waves we were going to tackle. Our video from the boat just shows the tops of the waves. This time it was AK Santini's turn to row. Zman would run the video camera. My job was to hold on tightly. In this video you can hear a little family discussion...I'm sure you have those too. It comes from having so many leaders/pilots in the family. Zman and I are urging AK Santini to "pull," quite often in the video. We wanted him to pull away from the center where the water was craziest. 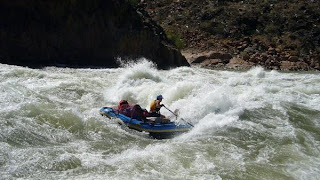 Mostly, you try and enter the rapid at an ideal spot and hope for the best outcome from there! I mean really...what good are little oars against such large amounts of churning waters? 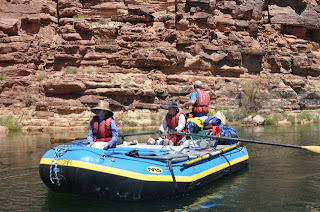 We were the second boat of our party of four to enter the rapid. Would the rest of our party make it without flipping? We would watch from the bottom, holding our breaths. Working away on my paper piecing units for my original quilt. I am sew loving this process. Learning more all the time! I think Bugs Bunny cartoons have had a large impact on my thinking process. During this trip I really did expect to see a few warning signs on the canyon walls but I guess those are only in cartoons. Big Sigh. Wrong attitude. This is what we came for...rafting rapids. Bring it on. The Grand Canyon has its own grading system for rapids, one through ten. Up to this point the most difficult we had encountered were sixes. Day 4, we would have our first level eight and two at a level seven with a few twos, threes, fours, fives and sixes mixed in. A little more about the rating system. There are no tens listed in the river guide we were using. I think those are rapids people are not expected to survive. Nines, eights and sevens, you are expected to survive if you take the right path and are lucky. Your boat my be flipped, you may take an unexpected swim...but you should...God willing...survive. The first eight rapid...Hance. I was familiar with the name of this rapid before arriving on the river. An acquaintance had mentioned the week before our trip that Hance in particular could mess with people. Lots of boulders to navigate. We pulled over to scout the rapid. This is when all the boat captains decided the route to take. I looked at it ahead of time just in case I thought I should walk it. What? Walk? No way! We're going as a family. Seventeen-year-old Zman at the oars. To recover from my great excursion of rafting through the Grand Canyon I have enrolled in Fabric Therapy. Here's the outcome of my first session. The two greens are batik wide backs. I love them. I feel like I should buy these by the bolt. The mottled purple and blue? It makes me happy so it must join my other friends in the studio. I'm trying to find the video card from the camera to continue my river saga. I'm sure everyone would like to see what it's like to ride through a rapid on the Colorado River. As I predicted, no one else in the family has taken the time to edit the videos from the trip which is why I never opted to own a video camera. (We just got the video camera before the trip). I already know I do not have enough time in the day to become an amateur editor. What good does it do to shoot video that no one will edit? I think I need more fabric therapy because I'm starting to feel anxious. Time for a little levity. There were some "easy" days...it's all relative of course. and her mom...I don't have a photo of her mom right now...she was the trip's main photographer so you know how that works...plus...I still have to come up with a call sign for her. Our group's big plan for the day was to visit the point where the Little Colorado River meets the Colorado River. It was a very tricky pullover but we made it. AK Santini and Z-man just missed it so they didn't get to experience it...but as I've already mentioned...they are thinking of going again so they might get another chance. I, however, can cross this off the bucket list. 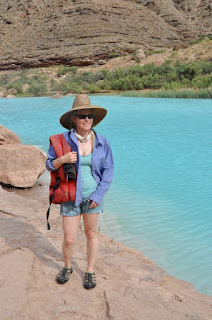 The water of the the Little Colorado really was a beautiful, light turquoise...just like the photo shows! We swam around a little. 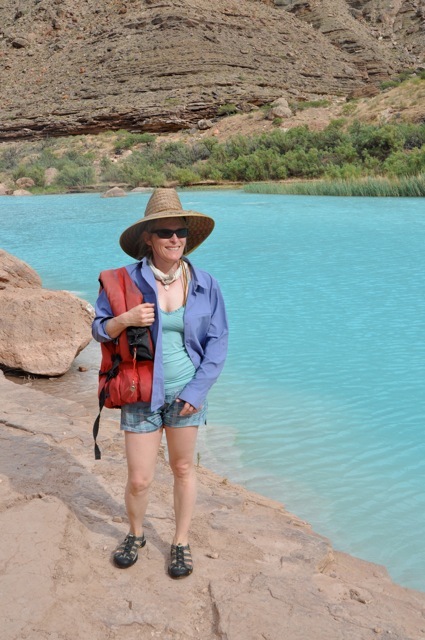 It was much warmer than the Colorado River water. This lovely color is from minerals in the water. The bottom of the river bed was coated with a whitish clay material. A few minutes after leaving this day spa we caught up with AK Santini and Z-man who had found our camp for the night and were unloading. This camp was most appropriate for our aviation family, "Crash Canyon." In 1956, two commercial airlines collided in mid-air near the confluence of the Little Colorado and Colorado Rivers. At the time it was the worst airline disaster and led to the formation of the FAA (Federal Aviation Administration) in 1958. This quilt is challenging...just what I need! It has taken me four nights to get the top row put together. I love it! Sometimes designs on paper pale in comparison to expectations when sewn up but this one is a keeper. Apparently I had too many adult beverages on this trip because I was using a GROOVER...not gruber...(Maybe too much Saturday Night Live influence. I think I was getting confused with McGruber skits...so much crap!) Through my error I have learned even more to enhance my experience. It's called a Groover because originally there was no comfy toilet seat on the metal box so you got some nice grooves on your backside when you used it. This was our guide book. We got this a few weeks before the trip. In it is a section of frequently asked questions. 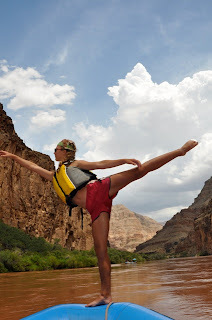 The first question - "So how hard is rafting the Grand Canyon?" The book's answer - "The Colorado River in the Grand Canyon has a reputation for difficulty that is not demonstrated in the injury data. 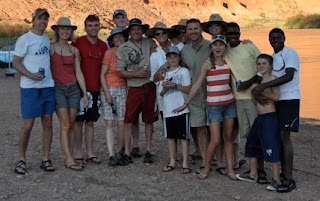 First time river runners with no prior canyon skill and the most experienced kayakers can all have fun." I saw the word fun and said...count me in! I like roller coasters...a racing heart beat in anticipation. Hmmm...injury data. Let me just ask...how would they compile information on injury data? A park ranger made sure we each had a life vest and wished us well at the launch location. Another park ranger crossed us off the the list when we pulled out of the water at the end. We got briefed a lot about using our satellite phone to call for help and setting up a helicopter landing site. We took our satellite phone and Z-man tried to use it at almost every camp site (he has a lovely girl friend)...only the first two and last two got reception. The other times we were too concealed by canyon walls to get reception. And a landing site of 75 feet...again...most of the time we were in the heart of the canyon and there is no way we had camps where helicopters could land. So do you have to be helicoptered out to become part of the injury data? I don't bring this up because I want to try and change anything...I am just trying to make the point that you are truly on your own for most of this trip. There were other rafters, kayakers and commercial trips with boats that had motors so there could be additional help from those on the river with you...but no magic wand to whisk you to a doctor for most of the trip. Prayer is the most effective source of help on a rafting trip. Into the Raging Water - Are We There Yet? It's Day Two...I guess like a lot of family vacations...there were periods of family strife. We had some of that going on with our boat on day two and three. We stopped to see a cool natural amphitheater where we had lunch. Here I am with my baby boy, Z-man. (It's a pilot thing...you know...like, "Top Gun." Everyone has a nickname.) We are actually in the shade provided by the amphitheater. I think this was the day we had our first major rapid, House of Rock...it involved avoiding boulders...our boat captain, AK Santini, hit it like a pro. Unfortunately, I still wasn't feeling much better about the remaining 10 days. Z-man started taking shifts rowing. He seemed to be a natural at it. I think it was this day that my husband said he and Z-man should put their names on the list for future private rafting trips...WHAT? AK Santini was obviously having a different experience than me! Night 2...only camp chore for me is setting up our tent and sleeping mats...easy. Z-man's team was cooking and AK Santini lost the straw-draw and was in charge of the lavatory every day. Each boat was packed a certain way and ours had the lav...or as it is called in the rafting community...the Gruber. AK Santini did an outstanding job of finding scenic locations for the Gruber. I know....you were wondering how this part of the trip worked. 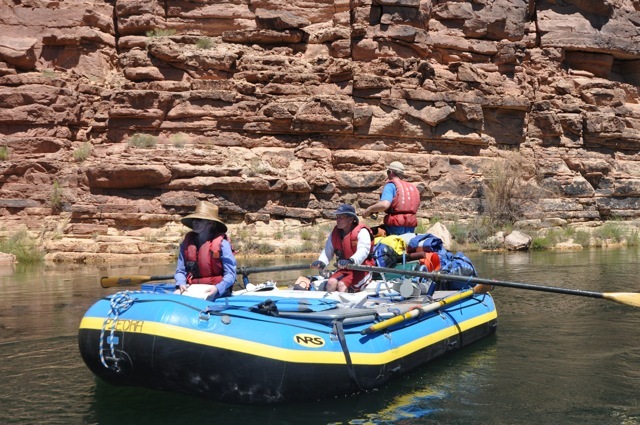 There are very strict rules for all rafters on the Colorado River. All poop goes in the poop Gruber and is carted out with our party. We had four poop Grubers to get through the trip. All pee went in the river. During the day the ladies had to dunk their bottoms. At camp we had a "pee only" Gruber for the ladies. I'm sorry to continue with the potty info but just in case you find yourself in this situation here is a trick when you have to pee in cold water...start the flow before you immerse your bottom half. I would never have learned that if I hadn't gone on this trip. I definitely don't ever want to use that bit of knowledge again. When I agreed to this trip I was told there would be shower opportunities...a hanging bag of hot water. I got it on Night 2. It worked but I only managed to get one other shower in the next ten days. Our days were just too long for anything resembling relaxation. We were constantly getting drenched in the rapids so we did get a regular rinsing. My life vest had a lovely musty...mildew odor that was with me everyday...but I was very glad to have that life vest! Once again the bears come to the rescue when I don't have much to say. Last night, looking out my sewing room window I was looking into the eyes of mama bear...she was sitting right outside my studio window!!!!! Now I tried to get a photo but she wasn't in the mood to pose so all I got was a big glare on the window from my flash. So just imagine...right where that flash is that a black bear is looking back at you. I haven't been home long enough to really get going on projects...dirty house, sick dogs and yard projects have been eating up my quilting time. Short term problem I'm sure. In the meantime...I have been fine-tuning a new EQ7 design inspired by a new line of Hoffman batiks that feature humpback whales...it surely makes me wonder...where do these fabric designs ideas come from? 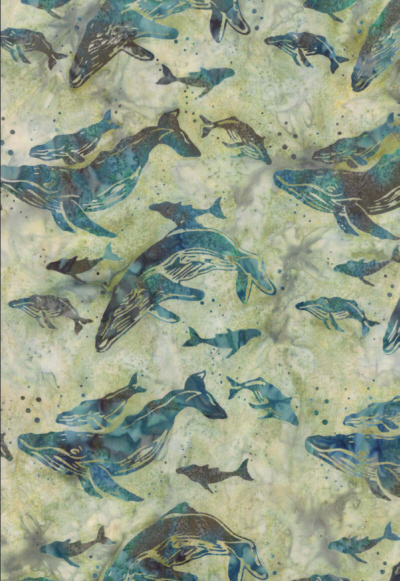 Who knew there would be quilters interested in fabric with humpback whales. It surprises me too! But...for the first time I tried to design the quilt before buying the fabric. Very rare order of events for me. My first thought when approaching this design was using the storm at sea block. Here's what was available in the block library of EQ. It was enough to get me started. I also thought it would be interesting to show my first jab compared to my current version. The night before departure. I'm in the orange shirt, my son's head behind me, hubby next to me in the red board shorts. How do you like the title for Jon Krakauer's upcoming book?... "Into the Raging Water." The big event of day one...it was my team's turn to cook for 15 very hungry people. (I just need to mention here that when I agreed to this trip in March I was told I would not have to do anything...no camp chores...I'm just saying.) We used a river outfitter who packed all our meals for us along with menus and recipes. But first everything had to get unloaded from all the boats. It was just like Martha Stewart's kitchen. A lovely 6-burner propane cooktop. On the menu...Appetizer - chips to dip in onion soup mixed with sour cream. Entree - Scallops and Shrimp with Linguine Alfredo, Green Salad, Garlic Bread. Dessert - Pound cake with sliced peaches and whipped cream. It was hot. It was sandy. Somehow the meal came out pretty good. Then it was time to clean up. When all was said and done it was 10 o'clock and I finally got to hit my comfy mattress...nope that's not right. I got to flop on an inch-thick air mattress and braise in our three-person tent. July and August on the Colorado River are monsoon season. It was very hot and very humid...I did not expect humidity. I laid in the dark wondering how we would ever make it through this trip. Could we helicopter in a rescuer? Seemed unlikely. Before leaving on my expedition I had the brilliant idea to send my machine in for her annual tune up. She looks so pretty. Despite being advised to bring lots to read on my trip...I did very little book cracking. I only read on the flights and my choice was a quilting book. A great book for new machine quilters. I got a few new ideas. It's a great addition to my library. There is a sample check-in sheet for those that want to provide quilting services...I thought it was perfect having been on both sides of the equation. Too many home chores to attend to before I can start sewing...SIGH. I realized I had made a major mistake. It's day one. Here I sit in a raft with my Katherine Hepburn hat trying to figure out if there is any possible way to get off this trip. My husband at the oars. My son fishing off the back. It looks so peaceful. My husband has always had boats with motors. He has only rafted once before on a group day-trip. But as I am often reminded by him...he is a fighter pilot...the implication is therefore that he is capable of doing just about anything and surviving. (He would remind you of the Great Santini.) Just one problem...I'm there too! After 20-plus years of marriage I have gotten so much better at saying no and not finding myself in these situations...but I was lulled into a feeling of fun when I knew whom the others were that would be going on the trip. I felt like I was a character in a Jon Krakauer non-fiction novel about stupid naive people who place themselves in life-threatening positions. Too much like the young man in the book, "Into the Wild," who foolishly hiked off into the wilderness of Alaska with a bag of rice and a homemade sleeping bag. Or how about the amateur mountain climbers who paid a fortune to be guided on Everest..."Into Thin Air." They all paid with their lives for being so ill prepared for what they would face. 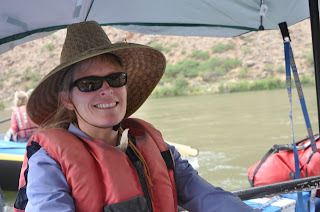 Debbie Bailey...soon to be written about by Jon Krakauer...homemaker, quilter, dog lover....what possible preparation did she have for a private rafting trip...none...nada....zippo. I had to dig deep and find my inner pioneer woman. I think I was part of a trial run for a new television series...maybe you've heard of it. "Family Expedition - Grand Canyon Rapids Edition." Some crazy rules to this show...you couldn't get voted off or kicked off early...you were in it till the bitter end. I guess it's obvious that I made it but the television trailer would lead you to believe that was questionable at times...cuz it was! I was so happy to have two very hairy dogs who each weigh 80 pounds crawl in my lap when we arrived home at 2 a.m. I missed Jenny and Forrest the most followed by indoor plumbing.